The native fingerlime Citrus australasicus just about ticks all the boxes in the desire to find the shortest route between the earth, the hand and the mouth – and what eating locally and sustainably is all about. An indigenous understorey rainforest shrub, local to our area, grows to a maximum height of 3m. This scrawny and thorny native citrus could be easily overlooked until you cut the finger-like fruit in half and out spills its fragrant citrus pearls that burst with flavour in your mouth – hence the name citrus caviar. Chefs around the world just can’t get enough of them to use as a garnish for all kinds of fish and seafood, especially oysters and salmon, spicy Asian salads and cocktail drinks. I have a friend who planted, as an experiment, about 20 grafted plants three years ago and mentioned to me that they were laden with fruit, but he just didn’t have the time to pick them – he runs our local native Nursery – and I just can’t bear waste! That’s where idle grandchildren on holiday, my foodie friend Grant and I came in. 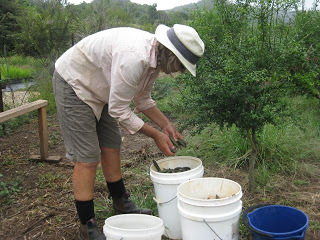 Over the last 2 days we picked nearly 20 kilos and, after a few phone calls, had most of them snapped up by local restaurants and providores. 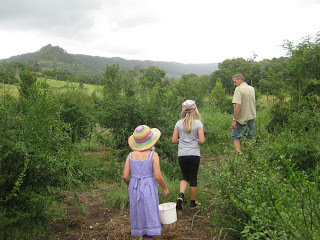 Around here I have planted the local fingerlime many times as part of Landcare revegetation programmes, and it does well if you are looking for a useful rainforest ‘bush tucker’ plant for your own native garden. It’s also good as part of an edible hedge. However, those being grown commercially are the grafted varieties like ‘Local Green’ – that has pink flesh and ‘Tweed’ with bronze fruit and lime green flesh. The plants are expensive to buy and grafting is tricky. I think my friend grafted over 100 and only about 10 were successful (and he’s an expert) – hence the price of the fruit – $45-$60 per kilo for export and $20-$35 local shop prices. However, a little goes a long way and they can be frozen. If you have never tried them, you are in for a treat. You should be able to find them in the shops now as it’s the main harvesting time. I love them as a garnish on home-made gravalax (cured salmon) – delicious. Last night I panfried some scallops and made a dressing with chilli, fish sauce, soy sauce and fingerlime – yum! Grant thinks they would be nice in a Margarita! Feels like we have earned one after the last two days of getting stung by hornets, bitten by fire ants, startled by cane toads, scratched to death, getting drenched in numerous rain showers and answering testing questions from the kiddies – but hey, we brought the harvest in! 1. 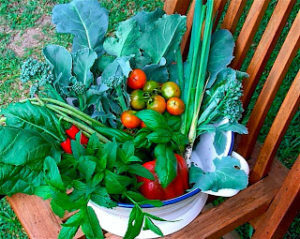 Seeds need to be refrigerated and will lose viability once removed. 2. Finger limes prefer a slightly more acid soil than most citrus (because they are an Australian native rainforest tree). 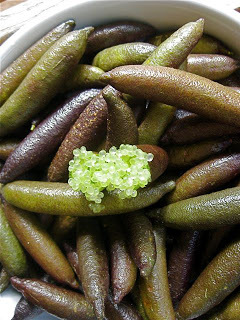 1) How long finger lime seeds can be kept? 2) What soil's type is suitable for them? 3) How long fruits can be born? Yes you can, but if it is from a grafted plant it will revert to the rootstock (see post on Citrus Maintenance and Pruning).